Hello Boyz,The 2017 PS.com Southern Regional Championship “The Texas Showdown” has finally come to an end and now that the dust has settled, I am able to give a brief recap of the tournament. I will be brief with this recap and try to cover some of the highlights of the tournament as I still have a video in the works that will highlight more of the tournaments events including sights and sounds in case you were not able to attend this year’s Texas Showdown. Blue Line Strong facing each other. Pool 2 included The Night Shift, LA Lawmen and New York Hounds. Pool 3 found SA Law, Team Texas, Missouri Lawmen and Suffolk County competing against each other. Pool 4 found CenCal Connection, Mid-Atlantic Lawmen and Stanislaus battling it out. Once the pool play was decided, many stayed afterwards to enjoy music, drinks and camaraderie. When players arrived at the fields Friday morning they were treated to the San Antonio Police Officers’ Association event barbecue pit with the smell of hamburgers, sausage wraps and other food items getting prepared for the next two days to come. Softball equipment vendors, health supplement vendors, whiskey vendors, real estate vendors, a satellite TV tailgate trailer, adult beverages, face painting, raffle items, music and more were on hand for entertainment. The world famous (or at least the PS.com famous) Dan Potter made the trip to Texas to ump on the main field at the Texas Showdown. As a tournament director, it gave me great confidence that our main field would have the experience and expertise Dan provides to oversee the final games of the Texas Showdown. In the Texas heat the round robin play commenced and once everyone got their first game in, the opening ceremonies took place. The presentation of the colors by the All American Boerne VFW Post #688 accompanied by the San Antonio Pipes and Drums were a great way to pay homage to all of our fallen officers including our two SAPD officers who had just been critically injured the afternoon before. Similar to the day before, and just before the presentation of the colors, we found out that SAPD Officer Miguel Moreno had passed due to his injuries, which made the playing of amazing Grace on the bagpipes and drums a very emotional moment for all who were present. Just a quick update, SAPD Officer Julio Cavazos is expected to recover from his gun shot wounds. Next, SA Law made the official announcement of its new 501(c)(3) charity called Shields for Kids (www.shieldsforkids.com) Shields for Kids was founded this year by members of the SA Law softball team. Shields for Kids slogan is “Providing 10-11 for children in need”. In San Antonio 10-11 is police radio code for “I need help” or “I need backup” which is what the Shields for Kids organization provides for kids in need. After the announcement, Shields for Kids presented its first donation consisting of game shirts to each of the kids of the “Best Friends” team of Special Olympics Texas, on the field. It was truly a special moment for our SA Law team and all who were in attendance as a member of the “Best Friends “ team and their team coach addressed the players and their families, thanking them for their service and support of their team. It is the hope of SA Law that other teams from the PS.com circuit see the value of an organization such as Shields for Kids and that those teams sign on as a branch of Shields for Kids in their communities across the Nation and abroad. Please contact Trini of SA Law if you are interested in starting a SFK in your area. PLEASE HELP AND SHOW YOUR SUPPORT FOR THIS GREAT ORGANIZATION BY VISITING WWW.SHIELDSFORKIDS.COM AND CLICKING LIKE & SHARING THE PAGE. After the opening ceremonies, the Home Run Derby got under way and man, was it a display of some power hitting. Only 14 players were allowed to participate, highlighting the best law enforcement long ball hitting the Texas Showdown had to offer. In the end, 3 players made their way to the finals with a 10 pitch each finale. Spencer Craver of North Florida Showdown went first with a 3 out of 10 run. Jake Bezus of CenCal Connection also put up a 3 out of 10 performance. The grand daddy of them all was Joe Monahan of the Missouri Lawmen taking the HR Derby with an impressive 4 homeruns in just 5 pitches solidifying him as the 2017 PS.com Southern Regional Texas Showdown Home Run Derby Champion. Joe received a HR Derby plaque and a bat of his choosing, which was a Brett Helmer Bomb Squad Series Flex. After the HR Derby, the round robin play continued with the great play of the Night Shift, Battle Born and Suffolk County on display with 2-0 performances. SA Law held their own in a pool 3 matchup with the eventual runner-ups of the tournament Suffolk County losing a close one 13-12. In Pool 4 CenCal Connection and Mid-Atlantic Lawmen had the only tie in pool play with a 16-16 lockup. Another pool 4 close one was the 20-18 score of Mid-Atlantic vs. Stanislaus game with Mid-Atlantic coming out on top. Over the course of the Double Elimination we saw some great teams battling back and forth with some outstanding plays and a clinic on how to hit when your homeruns are all used up. Notable performances include the unranked, but tough, Laredo Guns. The Laredo Guns have not been to the World Series yet as a team but we fully expect them to participate in the near future if not this coming year. Members Juan Porteous, Jude Patterson, Bobby Quintana and Ramiro Quintana all were a part of the SA Law’s 2016 Championship run of the Gold Division in Vegas. During the double elimination bracket play, the beautiful and energetic Alanna Sarabia lead the drawing and announcements of the raffle prizes. Although there were tons of great prizes drawn for, the top 3 were handguns. Colby Brooks of Mid Atlantic Lawmen won a S&W Shield 9mm, Frank Torronez of Battle Born won the second S&W Shield and Bobby McGhee of Ohio Lawmen, who was helping out LA Lawmen, won the Taurus Slim 9mm. Congratulations to all raffle item winners and thank you for supporting Shields for Kids. Towards the end of the double elimination bracket, Suffolk County found themselves battling The Night Shift in the losers bracket while NY Hounds faced Battle Born in the undefeated battle. A protest ensued concerning a possible ineligible player for the NY Hounds. Upon approaching coach Jimmy Wolters first, then the suspected ineligible player, the explanation of the allegation was communicated. After about 15 minutes of a thorough effort to confirm or disprove the allegation, it was determined that the player could not prove his eligibility and therefore would be removed from the game. Both coaches, along with Dan Potter and myself met to discuss the findings. It was explained that the NY Hounds could continue the game but coach Jimmy Wolters offered to voluntarily forfeit the game against Battle Born realizing that the inability of his player to confirm his eligibility would have a negative effect on his position as a coach and on his team for that game. 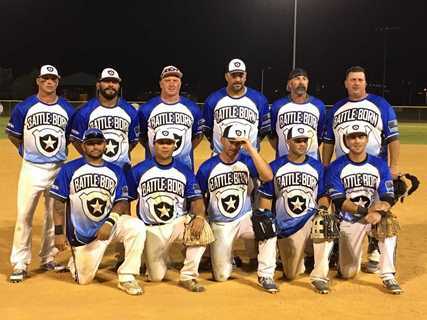 Ron Peeler accepted Jimmy’s offer and the game was stopped with Battle Born getting the win sending NY to face Suffolk County in the losers bracket. More on this incident in a separate post. Suffolk County defeated NY to setup the Championship game against Battle Born. After plenty of softball had been played in the serious Texas heat, a battle of attrition took place. These two teams played as if it was the first game of the tournament and their display of stamina was impressive. Suffolk County had a great game, defeating Battle Born 23-16 forcing the “what if” game. This final game was filled with hard hits and outstanding defensive plays on both sides. In the end, Battle Born caught fire and sealed the Championship with a 41-28 win. Butch Crozier, pitched every inning for all 9 games. Jaime Torres (SS) played day two with a broken thumb. Billy Boyd played CF and had a solid stick. Nick Bekas played LF and had a solid stick. along with prizes for 3rd, 4th and 5th place respectively. Great sportsmanship was displayed by all teams and the ultimate goal of sharing camaraderie and fellowship amongst our fellow brothers and sisters, while playing the game we all love, was accomplished. I again would like to thank all parties involved with coming together to make the Texas Showdown possible. I do not consider myself, and have never claimed to be, a tournament director on the level of the Jeff Blair’s, Del Pickney's or Terri Dugan’s of the circuit. I am just a policeman who genuinely enjoys the camaraderie of my fellow officers and coming together with other policemen to play the game I love. That being said, I am learning and I have listened to some suggestions on ways to improve on The Texas Showdown. Surprisingly, only two suggestions have been brought to my attention. One, consider no time limits or increasing the time limits during the double elimination bracket and two, have the fields dragged again during the middle of the day on both days. Upon bringing up moving the Texas Showdown to another location for the possibility of turf fields or to accommodate more teams, I was told by multiple teams that they would really like to keep the Texas Showdown exactly where it is taking place now. The comments were that the Northrup fields in Boerne, TX offer a feeling of closeness that other fields don’t allow. Besides having the whole park to ourselves, there is not a gate fee, you can set up a tent wherever you like, bring coolers, beer, water or any other thing you would like to bring in and due to the setup, you get to hang out in a proximity that really adds to the feeling of fellowship shared amongst teams. We will see what the future holds but a large part of this decision will depend on how many teams commit to the 2018 Texas Showdown when that time comes. As I explained to a few people since the tournament took place, I genuinely care about what my brother and sister officers think because I value my profession. In my opinion, there is no better compliment than to be complimented by your peers in your given profession. But, to have wives and family members attending the Texas Showdown personally complimenting our hospitality, our team, our families and our tournament was a great feeling. Our SA Law team put their hearts into this tournament and rallied the troops to ensure we would not disappoint and it seems as though we came through. For now I will concentrate on preparing my team for St. Louis then Vegas, and getting the video out for a more in depth look into the PS.com Southern Regional Championship, The Texas Showdown. I would again like to thank Del and Jeff for attending, all the comments and compliments concerning my family, my team and our tournament and all the volunteers and support staff for making this tournament a great success. Lastly, but most importantly, please keep our SAPD heroes Officers Julio Cavazos & Miguel Moreno and their families in your thoughts and prayers. Everyone of you holding the Thin Blue Line have my deepest gratitude and respect for what you do day in and day out. I am extremely proud to be a part of this calling and to have you as my brothers and sisters. Look for the video to come out soon. Stay safe and be smart out there.